Ngāti Porou is a Māori iwi traditionally located in the East Cape and Gisborne regions of the North Island of New Zealand. Ngāti Porou is affiliated with the 28th Maori Battalion and has the second-largest affiliation of any iwi in New Zealand, with 71,910 registered members in 2006. The traditional rohe or tribal area of Ngāti Porou extends from Pōtikirua and Lottin Point in the north to Te Toka-a-Taiau (a rock that used to sit in the mouth of Gisborne harbour) in the south. Mt Hikurangi features prominently in Ngāti Porou traditions as a symbol of endurance and strength, and holds tapu status. In these traditions, Hikurangi is often personified. Ngāti Porou traditions indicate that Hikurangi was the first point to surface when Māui fished up the North Island from beneath the ocean. His canoe, the Nuku-tai-memeha, is said to have been wrecked there. The Waiapu River also features in Ngāti Porou traditions. Ngāti Porou takes its name from the ancestor Porourangi, also known as Porou Ariki. He was a direct descendant of Toi-kai-rākau. Other ancestors include Māui, accredited in oral tradition with raising the North Island from the sea, and Paikea, the whale rider. Although Ngāti Porou claim the Nukutaimemeha as their foundation canoe, many Ngāti Porou ancestors arrived on different canoes, including Horouta, Tākitimu and Tereanini. The descendants of Porourangi and Toi formed groups that spread across the East Cape through conquest and through strategic marriage alliances. Kahungunu, descending from Ueroa, second son of Porourangi, is the founding ancestor of Ngāti Kahungunu, who occupy the region south of the Ngāti Porou tribal boundaries. Taua, descended from Kahungunu, is a prominent ancestor in Te Whānau-ā-Apanui genealogy. 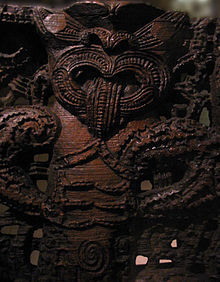 Ngāti Raukawa and the Tainui iwi have association through Rongomaianiwaniwa, daughter of Porourangi, and the marriage of the ancestress Māhinaarangi to Tūrongo. Ngai Tahu traditions also indicate descent from both Porourangi and from Tahupōtiki, younger-brother to the former. 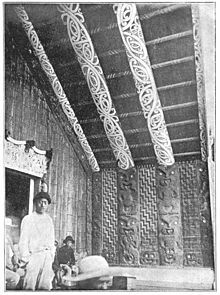 Wharenui (meeting house) in Waiomatatini, 1896, named Porourangi after the ancestor Ngāti Porou derive their name from. The early 19th century saw Ngāti Porou in conflict with Ngā Puhi during the latter's campaign of warfare throughout the North Island. This period also saw the introduction of Christianity to the region, which led to a period of relative calm and cultural development. Ngāti Porou chiefs were also signatories to the Treaty of Waitangi in 1840. Ngāti Porou experienced substantial economic growth during the 1850s. During the 1860s, the Pai Mārire religious movement spread through the North Island, and eventually came into conflict with the New Zealand Government. From 1865–1870, a civil war emerged within Ngāti Porou, between Pai Mārire converts seeking the creation of an independent Māori state (supported by Pai Mārire from other regions) and other Ngāti Porou advocating tribal sovereignty and independence. This conflict is generally viewed as part of the East Cape War. Ngāti Porou once again enjoyed peace and economic prosperity during the late 19th century. The 1890s saw the emergence of Sir Āpirana Ngata, who contributed greatly to the revitalisation of the Māori people. During the early 20th century, the population of Ngāti Porou increased substantially. They were active in their participation in both World Wars. After World War II, large numbers of Ngāti Porou began emigrating from traditional tribal lands and moving into larger urban areas, in a trend reflected throughout New Zealand. A large portion of the tribal population now lives in Auckland and Wellington. Te Rūnanga o Ngāti Porou was established in 1987 to be the tribal authority of the iwi. It is organised into a whānau and hapū development branch, economic development branch, and a corporate services branch, and aims to maintain the financial, physical and spiritual assets of the tribe. The common law trust is overseen by a board, with two representatives from each of the seven ancestral zones. As of 2018, the trust is based in Gisborne, and is chaired by Selwyn Parata, with Herewini Te Koha as both chief executive and general manager. The trust administers Treaty of Waitangi settlements under the Ngati Porou Claims Settlement Act, represents the iwi under the Māori Fisheries Act, and is the official iwi authority for resource consent consultation under the Resource Management Act. 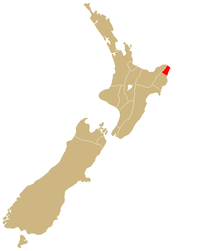 Its rohe is contained within the territory of Gisborne District Council, which is both a regional and district council. Radio Ngāti Porou is the official station of Ngāti Porou. It is based in Ruatoria and broadcasts on 89.3 FM in Tikitiki, 90.5 FM at Tolaga Bay, 93.3 FM in Gisborne, 98.1 FM in Ruatoria, and 105.3 FM at Hicks Bay. ^ "2013 Census iwi individual profiles: Ngāti Porou". www.stats.govt.nz. Stats NZ. Retrieved 13 June 2017. ^ "2006 Census – QuickStats About Māori (revised)". Statistics New Zealand. 2007-04-04. Archived from the original on 2007-09-28. Retrieved 2007-05-25. ^ a b c d e f g "TKM Ngāti Porou". tkm.govt.nz. Te Puni Kōkiri, New Zealand Government. Retrieved 2 March 2016. ^ a b c d e f g h Mahuika AT (1993-05-25). "History: Porourangi & Ngāti Porou". Te Rūnanga o Ngāti Porou. Archived from the original on 2006-12-11. Retrieved 2007-04-10. ^ a b c d e f g h Reedy, Tamati Muturangi (2006-12-21). "Ngāti Porou". Te Ara – the Encyclopedia of New Zealand. Archived from the original on 2007-04-30. Retrieved 2007-04-10. ^ Ngata, Apirana Turupa; Te Hurinui, Pei (1970). Nga moteatea: he maramara rere no nga waka maha, he mea kohikohi na A.T. Ngata; na Pei Te Hurinui i whakapakeha. 3. The Polynesian Society. p. 323. Retrieved 2015-05-26. That line traces out to Porou-rangi, whose (original?) name was Porou-ariki te mata-tara-a-whare, and Te Tuhi-marei-kura of Rauru. ^ Reedy, Tamati Muturangi (24 September 2011). "Ngāti Porou: Porourangi whare, Waiomatatini". Te Ara - the Encyclopedia of New Zealand. Wellington, New Zealand: Manatū Taonga | Ministry for Culture and Heritage. Retrieved 12 May 2012. ^ "Radio Ngati Porou". Radio Ngati Porou. RNP. Retrieved 14 June 2015.